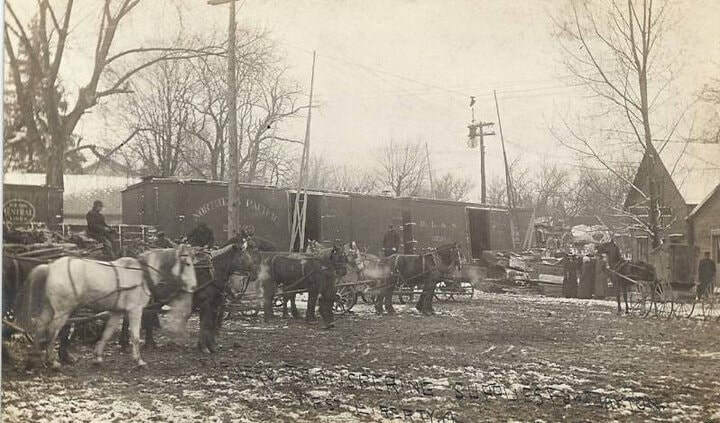 Train unloading in West Liberty used by permission of Anita Yoder. Trolley Car on Detroit Street used by permission of Anita Yoder. Today, getting into a vehicle, plane, boat, motorcycle and many others, we don't think twice about. They get us where we need to go without taking very long. Back in early history the choices were very different. 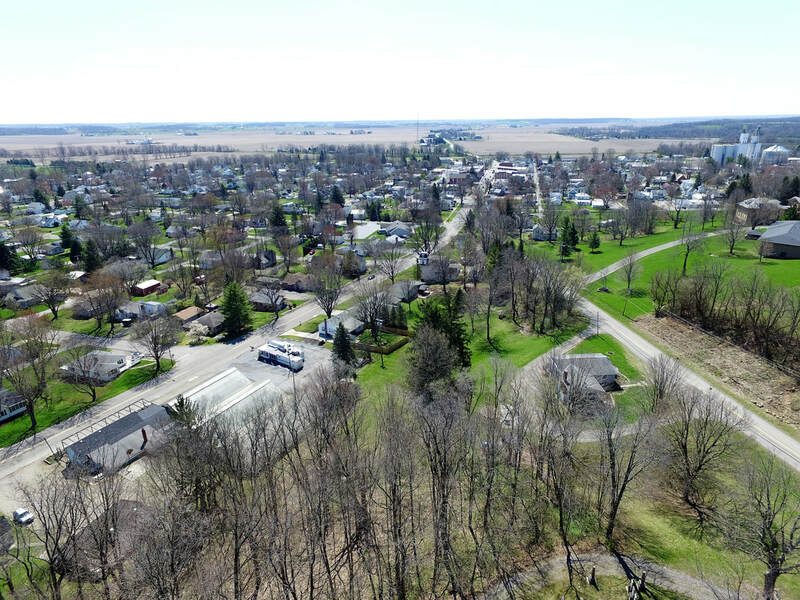 People in West Liberty could walk, maybe ride a bicycle, take a canoe down the Mad River, hop on their horse or hitch it up to a buggy for the family or to pick up supplies when you went to town. These were all normal at the time it but took much longer to get where you were going. They didn't have roads like we do today but followed the old Indian trails. Sometimes in a low or swampy area they would lay down a corduroy road. These were made by placing sand covered logs perpendicular to the direction you were traveling. Hulls Trace was a well known trail that General Hull's Army used to marched to Detroit, Michigan in 1812. This is now West Liberty's main street called Detroit Street. The largest carriage maker in town was Simeon Atha. He had a wheel plant called The West Liberty Wheel Company that made 30 sets of wheels each day. The West Liberty Mad River & Lake Erie Railroad came through town in the late 1800's. The first station was built by the M.R. & L.E. but exact location was not mentioned. The second train station was located at Baird and Miller Streets. Later, the Big 4 had a cut off at West Liberty in 1926 and the station was by the track. This is the Depot station that was later moved to Marie's Candies, and is in use once again, just a bit differently. There was also a depot station by King's Feed but it burned down. Mention was made of a depot station on Twp Rd 193 at Runkle Avenue. All prior stations were located on the old main line on Baird Street. 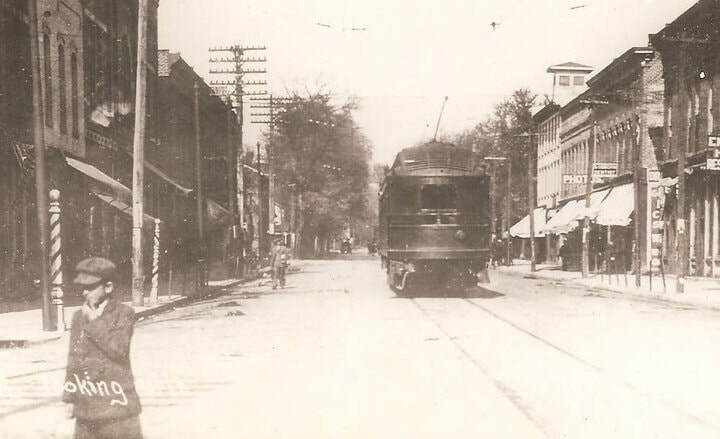 Margery Headings remembers taking the Trolley to Bellefontaine and back again when she was a teenager. The Trolley was part of an Interurban Electric Railway formed in 1907, consolidating with 14 smaller railways. It connected Toledo, Lima, Dayton, Columbus, Cincinnati and smaller towns in between. At one time it had 617 miles of track, but went bankrupt in 1921. It's because of our ancestors who kept trying to improve on modes of transportation that we can get around much easier today. Sources: The Heritage Collection History and Biography, Historic West Liberty, Ohio, and Wikipedia. ​Every village has its own unique Church history and West Liberty is no different. The first known church was started in 1814 before the town was founded and called the Muddy Run Christian Church or Bethel Church in its beginnings. The church was constructed of logs near the crest of Ordway Hill west of West Liberty. Ordway was the name of a prominent business man in town who had a two story brick boot and shoe store. The church disbanded and part of the members formed the Glady Creek Church further west and the rest went to West Liberty where a church was organized. Pastorate of the West Liberty Church also had McKees Creek Christian Church and later the Muchinippi Christian Church. In 1927 the named changed to Congregational Christian when the Congregational and Christian Churches united. In 1961, the church voted to become part of the United Church of Christ- merger of Congregational, Evangelical and Reformed denominations. 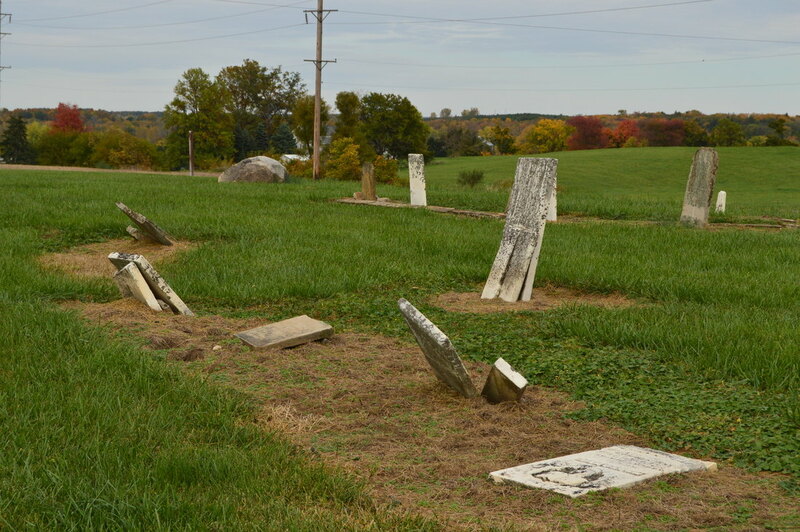 The original Muddy Run Church is no longer, with only the cemetery remaining today on Township Road 195. The West Liberty Methodist Church was organized in 1830 and was built on ground purchased from Thomas P. Miller. It was located on East Baird street and was later used as a residence and business room and later destroyed by fire. A better structured building was constructed in 1849. The pastor did a circuit of the Methodist, Wesley Chapel and Springhills churches in 1889. The Early Church was a shouting church. Demonstrative and loud but very serious. 1905-1910 the Ladies Aid Society was busy making money for church improvements by selling meals at the Logan County Fair. Four ladies were the first to be elected to the board of stewards. This was the first record of woman holding office in the church. In 1841, the 1st Presbyterian Church had no place to meet for worship so they accepted the offer of the Methodist Church to use their building. Then in 1842, the use of the old stone distillery became available. The Rev. W. B. Price told of the first communion service held at the new location. The former distillery had been infested with rats and the members were working on getting rid of them through the use of poison. The rats became sick to death during the service and now and then a rat would fall from the stone wall into the congregation. Thankfully the worshipers were to focused on the service that the barely noticed. In 1890, during Sunday School, fire erupted in the belfry and the church was quickly evacuated. The building burned down except for the brick and stone. The windows, furniture, organ, library books, and other valuables were saved. The Lutheran Church was borrowed for services until a new building was completed in November of the same year. McKees Creek Chapel has long been known as the “Little Church beside the road. It was built in 1859 beside the road between West Liberty and Bellefontaine. The road at that time was called Bellefontaine- West Liberty Pike and the church originally called McKees Creek Christian Church after the creek that ran through the valley at that time. The church closed sometime for unknown reasons and reopened on February of 1884. McKees Creek ended it's association with the Christian Church in the summer of 1932. The church reopened in July of 1941 under the direction of the Evangelical Friends Church. In 1987 it no longer was affiliated with the Friends church and became a non-denominational church called McKees Creek Chapel. South Union Mennonite Church was started with a group from an Amish settlement from Logan County. In 1845 Elders Moses Miller and Levi Miller helped organized a new church. Services were held in the family homes until 1857 when the first meeting house was built northwest of the present building. Being built on the farm of John Kenagy and Bishop being Jacob C Kenagy it was called the Kenagy Church. A new name was given in 1868 of the King Church. Needing more space a new building was built in 1876 on the corner of Rt 68 and Rt 507. Then it received it's current name South Union Mennonite Church. The Bethel Mennonite Church began out of the younger generation not wanting services in German language as was so in the older Mennonite Churches in the area. The younger folks wanted English spoken in Sunday School but was told no, so they began meeting in their homes. 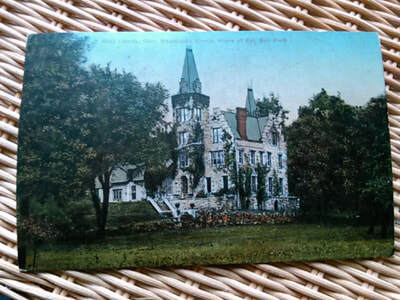 Their number grew so in 1895 plans began for a new building and was dedicated in 1896. The church was struck by lightening in May of 1923 and was a total loss. It was rebuilt and completed by January 1st, 1924. 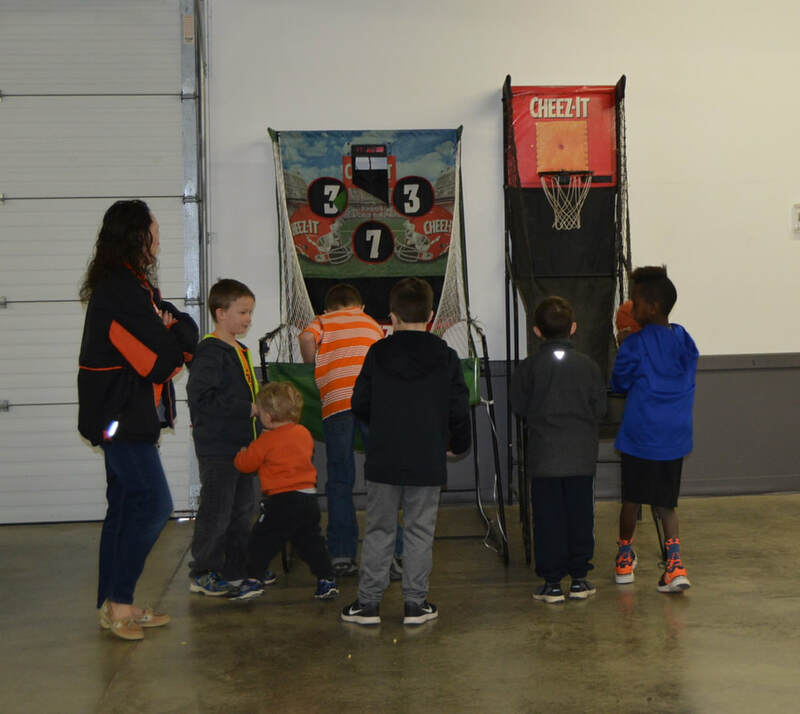 The Bethel Mennonite Church was the first to hold Vacation Bible School in the community in 1935 and grew so much that in 1947 other churches began holding their own VBS. The Mennonite Children's Home, now known as being a part of Adriel School, housed many children and they attended the Bethel Church. When many Amish Mennonites from Pennsylvania, Fairfield County, Ohio and Illinois relocated to West Liberty they had no church to serve their needs so the Champaign Church was started in 1845 in one of the homes. A church building was built in 1856 on Ludlow Road , about two miles from the present location. The present house of worship was erected in 1875 and name changed to Oak Grove on Mennonite Church Road. In 1900, the church started a mid week prayer meeting in the homes but in 1901 they began using the church. These meeting were held because the Sunday School workers were attending a Quaker revival meeting near West Liberty. When Benjamin and Elizabeth Piatt moved to the outskirts of West Liberty in 1828 the nearest Catholic Church was three hours away by horse and buggy. Elizabeth wanted her husband to build a church near their house but Benjamin thought that the sawmill and gristmill should be finished first because they brought in money. One day when he was called off to Cincinnati on urgent business, Elizabeth told the workers to stop what they were doing and using wood cut for another project had them build a church. It was completed by the time Benjamin arrived home and was affectionately known as St. Elizabeth's Chapel or the Piatt Chapel. The chapel no longer exist but the cemetery is still there on Township Road 47 just down the road from the Piatt Cabin. The Church of God was started after a member of Oak Grove attended a camp meeting in Anderson Indiana. He orchestrated a camp meeting in West Liberty and it was held on a farm southeast of the Ohio Caverns. Another meeting was held two years later in the same place. A school building at five points, (intersection of Co Rd 1 and Co Rd 5) was used to hold meetings when they were regularly held. The church building was moved to the west side of town in 1910 on Taylor street. The Nazarene Church bought the building in 1924 and the present building was bought and they moved in on Liberty street. The property consisted of four lots and was purchased by Ezra Riehl. Grace Chapel, under the belief that others from another state wanted to tell people how to and what to believe started a new church to get away from that as they wanted a biblical based church. The believers began meeting in a basement until funds could be saved to build. They outgrew the basement but all they had money saved up for was a basement so they built the basement and covered it so they could hold meetings. They became known as, 'the groundhog church.” As they saved money they were able to add to the structure. In November of 1956, plans were underway and in December the started the building and it was dedicated in December of 1963. The newest addition to our Church family took up residence in the former Vintage Inn Restaurant just north of West Liberty. Bill and Mary Walker moved to Bellefontaine after being called to start a church. Their first service was held on December 3, 2006 at The Friendly Senior Center in Bellefontaine. Needing more space they moved into their current building on South street in January of 2010. They broke ground for more space for a sanctuary, gathering space and offices being built to the current building. Each church has it's stories of God's love, faith, family, fellowship, and are rich in history, missions, and helping the community. Sources: Historical West Liberty, Ohio and Church Websites. It all started in 1897 because seventeen year old farm hand, Robert Noffsinger was curious. After a little digging in a low soft area of a field where rain water seemed to be disappearing quickly, he discovered a crevice which led into the caverns, today known as The Ohio Caverns. 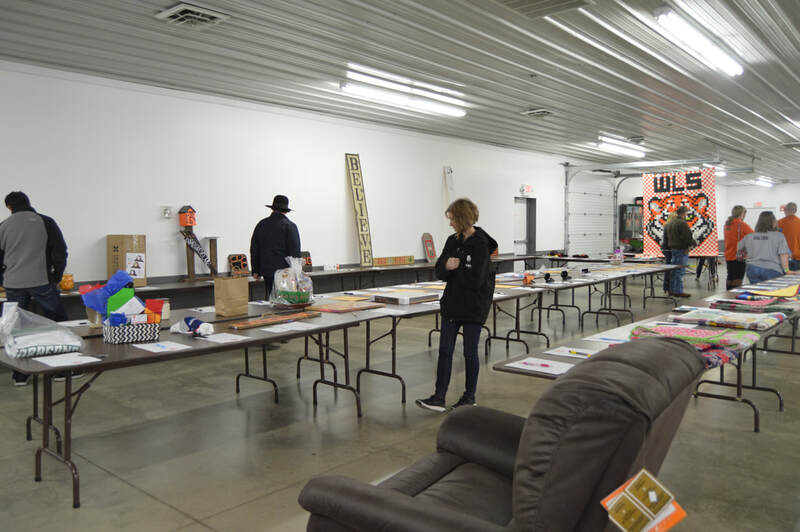 Located in the Northeastern part of Salem Township, outside of West Liberty: it is the largest cavern in Ohio and the most colorful of caverns in America. Tours were offered the same year the cavern was discovered but they were not guided and you were on your own. By 1922, more passageways were opened, electric lights lit your path and a tour guide led the way. In 1925 the original section was closed and a new section was opened which included more beautiful scenery. ​Today, tours are offered at frequent intervals, and while waiting for your tour to begin, you can browse the great souvenir gift shop, do a little gem mining or check out the 35 acre park. Once you get started, you are thirty-five feet underground and the temperature is always a cool 54 degrees through out the year. As you weave through the path, sometimes narrow, many natural wonders meet your eyes. The Stalactites, which form from the ceiling down hang “Tite” to the ceiling and the Stalagmites created from the drips of water above, hope the “Mite” reach the ceiling someday. When a Stalactite and Stalagmite grow to meet it is called a column. Duel formations can also be seen which means there is secondary growth. The Soda Straw, a small thin formation resembling a straw can be found. Another type of formation is called the Helactites, which form from the end of a straw growing at different angles, defying gravity. The beauty is breath taking! ​Fifty-five feet, sixty-seven feet and at The Caveman's Couch you reach the half-way point. The lowest you go is 103 feet, yet you wouldn't guess that as you were walking. There is the Natural Bridge, Crystal Sea, The Old Town Pump and the Cert Rock Glasses. The following rooms are magnificent, The Fantasy Room, The Big Room Jewel Room, and The Palace of the Gods. Tucked into a recess is the oldest and move impressive formation of all, The Crystal King, which is 200,000 years old, five feet tall and growing! The colors seen trough out are amazing! A beautiful mixture of different hues all naturally made by the hand of God. The Columbus Gray Limestone, Chert Rock and Blue Ohio Shale. Iron deposits make yellows, oranges and reds: while purples, blues and blacks are from Manganese deposits. Lets not forget the brilliant white from crystal formations. 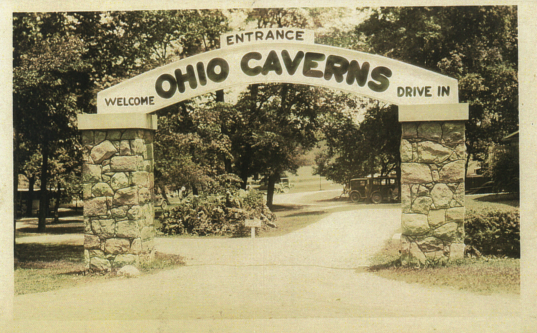 An Historic Tour opened in 1997 celebrating 100 year anniversary, bringing an extension to the regular your by reopening the old 1987 section, to share the history of the Ohio Caverns. Either tour is a wonderful way to experience the beauty beneath us. On Tuesday, March 25, 1913, the Miami Valley received 8 inches of rain in 48 hours, causing the Mad River to overflow its banks and cause the “Great Flood” in West Liberty and surrounding area. ​In my grandfather Lee Roy Birt Sr.'s memoirs, he mentions the flood at a time when he was a lad of 9 years old. 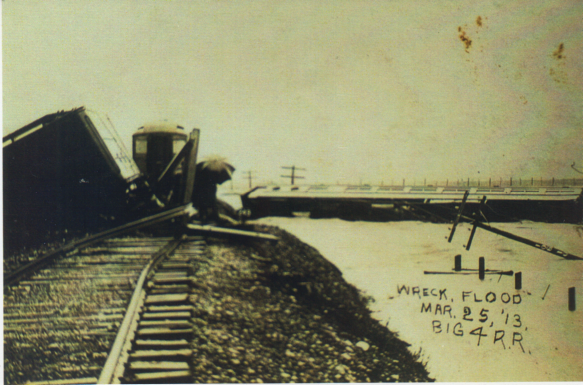 If the flood wasn't already tragic enough, the rail road bridge south of West Liberty was weakened by the flood waters, collapsed under the weight of a Penn Locomotive as well as a Pullman sleeper and fell into to the raging waters at 1:00 am. The Penn Passenger Train #3 was headed west from Columbus to Chicago via Urbana. It was stopped because of washouts in Piqua. Plans were to detour to Bellefontaine then west being pulled backward to Bellefontaine from Urbana; then west to Indianapolis Division Big Four to Union City then rejoin the Penn System. The train's passengers were safe with only 7 injured. James Woods, Engineer and C. E. Tilton, Fireman, of Columbus sustained slight injuries and were found that day. 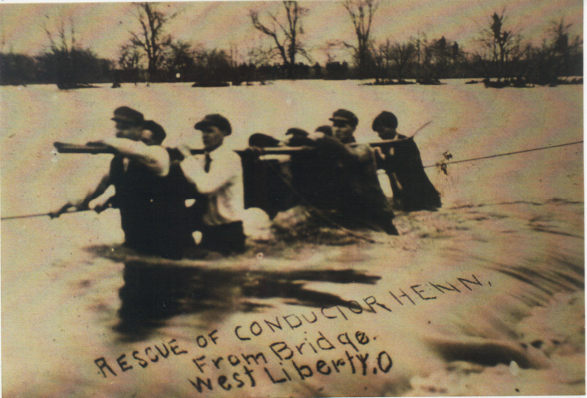 The Conductor, Phil Henn, was rescued after 12 hours of water exposure. The only life lost because of the train accident was that of the Elwood Howell of Columbus, the Brakeman. His body was found 24 hours later lodged against a farm fence near Pimtown Road. Crews were sent to recover the train cars from the muddy waters. This was not an easy task because when they put a pile trestle in place of the bridge, they drove piling through the trailer and ash pan of the engine. This made it impossible to raise the engine until the pilling could be removed. After reconstructing the trestle in part, it wasn't until August 12 that the first attempt was made to raise the engine. However the bed of one of the derricks (wreckers) broke a king-pin under the load and another derrick was called to the scene. The following day the engine and bridge spans were lifted. In spite of being under water for four and a half months the locomotive was found to be in good enough shape to repair and put back into service. #1- Looking south at the train in the flood waters. #2- Rescue of the train Conductor Henn. 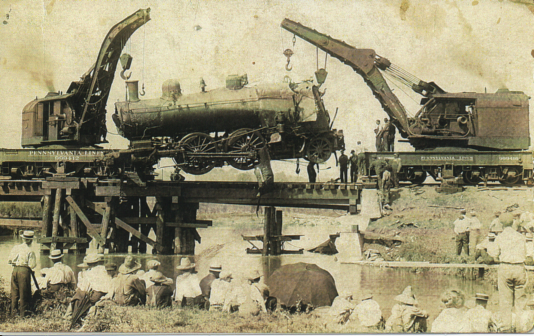 #3- Raising of the engine being pulled from the flood waters in August of 1913. There is an American Proverb that says, “Behind every great man there is a great woman.” I'd like to introduce you to one such woman, Elizabeth, wife of Benjamin Piatt. 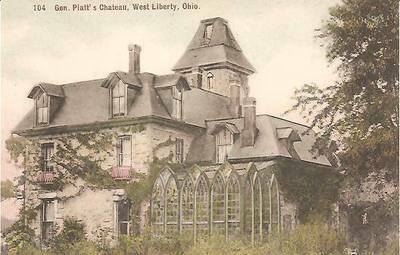 In 1828, the Piatt family came to West Liberty to live on a large farm and at that time the area was sparsely populated. None the less, Elizabeth worked hard to make it home. There are 3 things that I admire the most about Elizabeth. Her love of children, her ability to get things done, and her compassion for others. Benjamin and Elizabeth were blessed with 10 children. Daughters Hannah, Martha, Arabella with her infant daughter and sons, Donn and Abram, traveled to West Liberty to make it their home. Wykoff, the oldest, was an established lawyer in Cincinnati. Four other children died in infancy or early childhood. They also had 3 girls they took in while in Cincinnati, all were married form the Piatt home. The 4th, Patsey, was a poor idiot girl. She was abused by her master, so Elizabeth trained her to be a good servant. At Mac-A-Cheek, their home in West Liberty, they added 14 more children to their family. Five granddaughters and two grandsons went to stay with Grandma and Grandpa for awhile after the death of their mothers. Six more girls and one boy not related, also made their home with Benjamin and Elizabeth. The Piatt's were of Catholic Faith. The nearest Catholic Church in Columbus, was 3 hours away by horse and buggy. Elizabeth wished for Benjamin to build her a church near their home. Benjamin was more inclined to build things like the sawmill that would bring in money first. One day Benjamin was called off to Cincinnati on urgent business. As soon as he left, Elizabeth told the workers to stop what they were doing and supervised the building of a log hewed chapel. She had them use the wood set aside for building a workshop. It was completed before Benjamin arrived home and was affectionately named St. Elizabeth Catholic Chapel. ​Elizabeth was a pioneering woman who took care of her own and others, took charge when things needed done and changed the lives of the slaves who passed her way. She may not have been a well known figure from the history books, but think of all the people whose lives she touched and changed forever. Long before I made West Liberty my home, the valley was home to the Shawnee Indians. 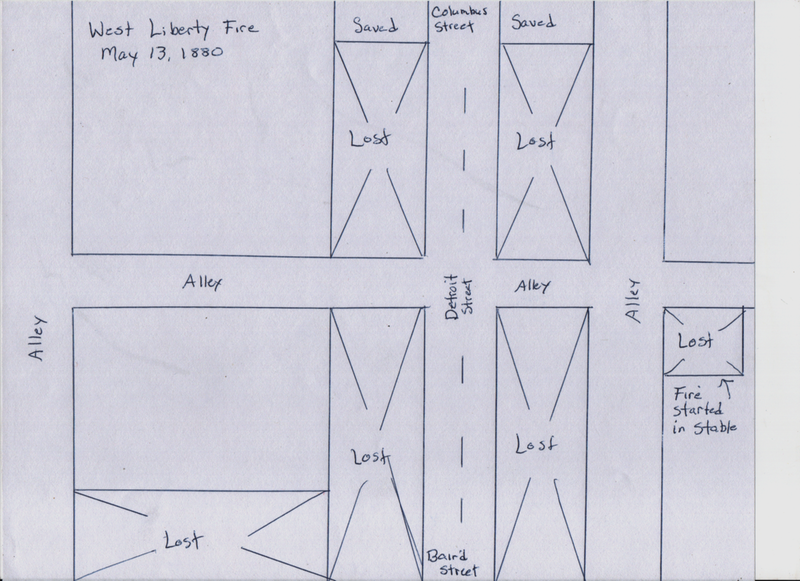 There were three Indian villages close to the area of where West Liberty would be located years later. Mac-O-Chee, was east of town, Pigeon Town was 3 ½ miles north west and Wapotomica was below Zanesfield. The Mac-O-Chee villagers were the ones who gave the valley it's name- “Macachack”, which means “Smiling Valley.” The village was located on top of a hill overlooking one section of the Mac-O-Chee Creek. As the creek wound through the valley, it curved around the hill on which the Indians lived. When the Shawnee people gazed down upon the creek it appeared to be smiling at them. Thus the name, Smiling Valley. This Mac-O-Chee village was the head quarters of Chief Moluntha, Great Sachem of the assembled tribes. It was after the Revolutionary War that the white man began encroaching on Shawnee Indian Territory. In 1785, a peace treaty was made with several tribes but the Shawnees refused to agree. In the fall of 1786, Colonel Benjamin Logan, was commissioned by General Rogers Clark, to attack the Mac-O-Chee Towns. Logan sent Colonel Robert Patterson and Colonel Thomas Kennedy to the left and right wing, while he commanded the central division, with Colonel Daniel Boone and Major Simon Kenton leading the ranks. The Indians were warned but not soon enough. Most warriors were hunting and the ones that weren't, were either killed or taken prisoner. Chief Moluntha, his three wives, one of which known as the Grenadier Squaw, the sister of Chief Cornstalk; and several children were also taken hostage. Colonel Hugh McGary defied orders to leave the Indians who surrendered unharmed, and in a rage killed Chief Moluntha. It is said that the remaining Shawnees left the area and established settlements at Blanchard Fork, located in North West Ohio. Even though the Mac-O-Chee village is no longer in existence, the legend of Squaw Rock remains and has been passed down for many generations. During the raid on Mac-O-Chee by Colonel Benjamin Logan, one of his soldiers spotted someone hiding behind a large rock at the edge of the village and thinking it was a brave, he took aim and shot. He went to check on his target and found he killed a squaw. Upon closer inspection he found a baby boy laying beside her. He was so filled with remorse that he buried the squaw at the base of the rock and took the baby home with him to raise as his own. The man also had a young daughter and the two children grew up happily together. As they got older they became great friends and fell in love with each other. However, the girl was worried about what people thought of her marrying an Indian so she married a rich white suitor instead. The day after the couple were married they were found murdered in their cabin and the Indian boy was never seen again. ​Squaw Rock still stands on the hill overlooking Smiling Valley even though that section of the Mac-O-Chee Creek is no more. It is a reminder that this land was special to those who lived here before in the beautiful Smiling Valley. West Liberty, our own little piece of heaven on earth, then and now. First picture used by permission of Dale Humble. Ariel view of West Liberty today. Second picture (below) is used by permission of the Town Hall. West Liberty in 1910. John Enoch (pictured left) spent eighteen years prospecting for gold before heading to the Miami Valley in the year 1815. It isn't known if he was hoping to strike gold but apparently what he did discover was well worth the trip. He was one of the early pioneers to settle in the valley, building a home then a gristmill which was powered by the Mad River and the Mac-O-Chee Creek. The settlement was known as Enoch's Mill until being founded in 1817, then it was named West Liberty. 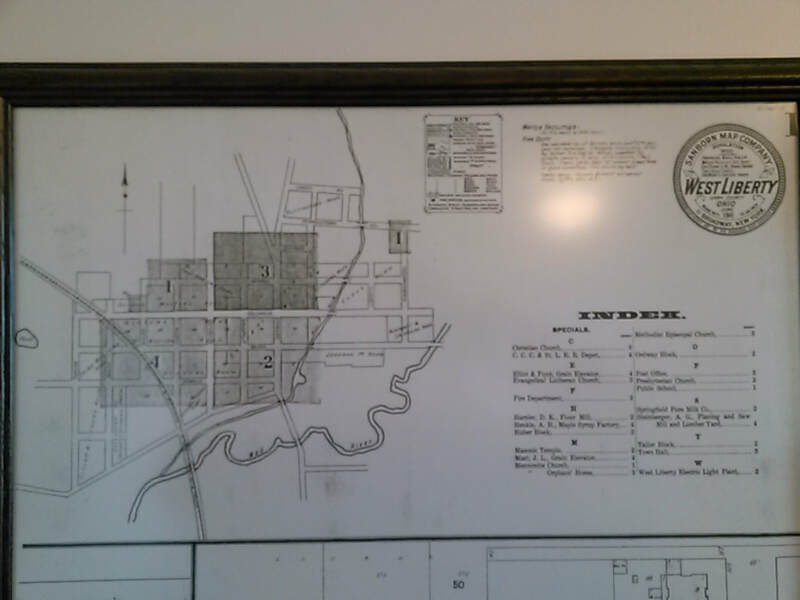 In 1834 West Liberty was incorporated and vying for the main town in Logan County. Bellefontaine was more centrally located so they won the county seat. In the late 1880's Enoch's Mill (pictured below), owned by Jacob Anstine, provided additional service by providing electricity when a dynamo was connected to the water wheel. Since there were no meters at each home users were trusted to use no more than five bulbs at once. 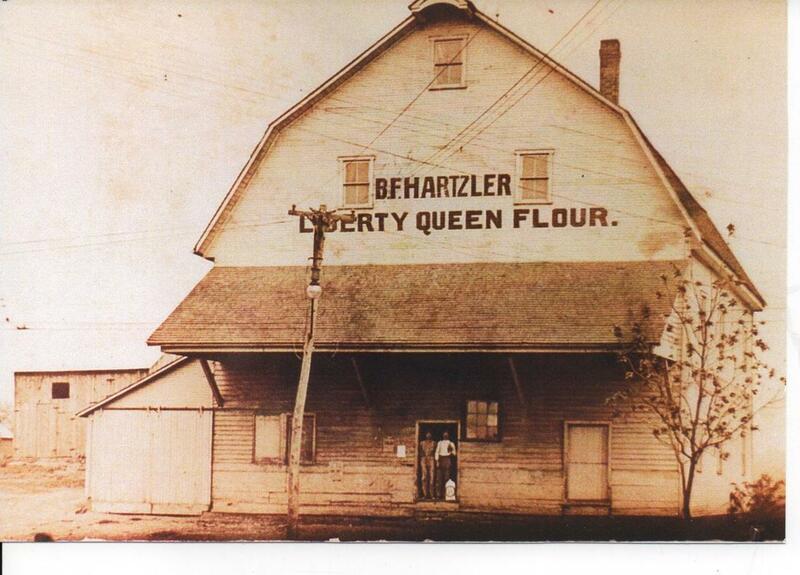 The mill had a long history until it burned in a fire in 1962. Since it was not cost effective to rebuild, the mill was torn down. So it's the size, people, memories, favorite restaurant, home town, birth place for some, heart, spirit and more, all rolled into a great place to live. John Enoch must have agreed since he lived the remainder of his life in West Liberty. He may not have struck gold but he did hit the mother lode when he found such a beautiful valley in which to call home. In 2006, Project Of Ohio History Connection and the State Library of Ohio interviewed residents from all over Logan County, and I would like to share with you four from the West Liberty area. As a child John Dete wore high top boots which were a chore to lace in the mornings. He walked a mile and a half to school and if school was cancelled the kids didn't know about it because there was no dependable radio or phones. For fun they played cards and Monopoly. Outside games of Fox and Geese, Tag and Hide and Seek were enjoyed. They raised chickens and his family would wash, weigh and crate 30 dozen eggs for the Egg Man's weekly visit. Eggs were 17 to 20 cents. They would get 200 pullets of half roosters and pullets and would eat the roosters. Bunkerhill Coffee was 19 cents a pound. It was 2 cents for local mail, and 3 cents for out of town. The train didn't stop for the mail, the mail bag hung from an arm that the train would snag as it went by and they would throw mail bags off the train onto the ground. Coal oil lamps were a step up from kerosene and when they heard an airplane they would run outside to see it. He made his own fishing pole with bark from an Elderberry stick, use cotton cord, a cork and a bent pin for a hook. Caught lots of Sun Fish and it was the best fishing time he and his sister ever had. It cost $10.00 for a new car and 25 cents for a license. Dete remarked that there are three types of time, the sun, railroad, and standard times. Things that has changed were genetics in agriculture, and farm equipment. John Dete and wife Janet have lived on CO RD 287 for many years, having bought the farm from Dr, Miller in the early 1970's. The farm house was built by R. J. Piatt, son of General Abram Piatt. Kenneth Harr went to school in a one room school house on the family farm then attended Iron City. As a young boy he helped carry water in a wooden keg to the men in the field and when the farmers went from farm to farm at Threshing time. His father used horses for farming and the family bought their first car, a 1926 Model T Ford and at ten years old drove the car home on the road. His mother was not happy about that. He showed beef steer in 4-H. Back then the county agent traveled out west, bought steer, and numbers were drawn to see which boy got which steer. The family had a big garden and the sweet corn had to be canned right away because they had no way to keep it cool. Butchering time was not only a family affair but neighbors helping neighbors. The traction line went bast their house and it cost 5 cents to go to Urbana or Bellefontaine. Saturday night they went to town to sell cream and eggs and buy groceries. They ordered a Farmall H Tractor but didn't get it until after the war because they stopped making them while the war was going on. Transportation was the biggest change through out the years. Phyllis Morris started doing chores at 3 or 4 years of age. Collected eggs and brought in kindling for the wood cook stove. At age 5 she carried wood into the house. The family had 4 horses, two teams, plow, rake, threshers, but no tractor. They had a variety of farm animals, dog, cat, pigs, cows, duck, geese and goats. As a child she contracted scarlet fever and was quarantined to one room for six weeks. A note was put on the house to warn others to keep their distance. The had a farm across the road from the Logan County Children's Home. The school bus had benches on each side and one down the middle, and was very comfortable mode of transportation. No bathroom nor electric, instead had coal oil lights and a trough with cool water to keep milt cold. Morris liked to make doll houses, and cut out clothes and furniture from the magazines. She never cared for butchering hogs and would cover her ears so she didn't hear them squeal. The had a summer kitchen which was a separate room in case of fire. They always appreciated what they had to eat and didn't complain about what they had. Her mother made her dresses and they went barefoot in the summer and wore their one pair of shoes a year during the winter. In the fifth grade the family moved to West Liberty, so Morris would walk to school. She recalled the Tornado in 1948, ad when the mill caught on fire. It was so hot it broke windows in the house across the street. The mill race ran through town to Zanesfield. Biggest changes, cars and appliances. She always appreciated what a strong community spirit West Liberty has. Phyllis Morris and her husband John have lived in West Liberty many years. The Smucker Sisters were Irene King, Cristine and Isabel. The family first rented a farm then purchased it later on. They would do business at both Bellefontaine and Urbana. Saturday night was going to the store in West Liberty to purchase things that the farm did not provide. They went to Salem School in Kingscreek and rode in a two horse drawn hack then later a motor vehicle school bus. They used buddies on summer roads and their families first car was in 1914 or 1917. Growing up the girls used to swing under the trees, played in the woods,and the creek that ran through the farm. They enjoyed the farm animals of chickens, cats, dogs, and horses. They never went to the movies. They would follow their parents when doing chores until they were old enough to so them alone. Irene was a budding artist and attended Urbana University for training. The most daring thing any of them did was when Irene went to Michigan with her boyfriend, later husband, by motorcycle. Going to church was a big deal and they like to sit on the front porch to read. Their father had horses until he purchased the first tractor in the community. There were big gatherings for butchering, threshing, hay making and silo filling days. During the depression they were in danger of losing the family farm but thankfully were able to keep it where many others weren't as fortunate. The family had a singing group for 10 years traveling all over the United States to share God's word in song. 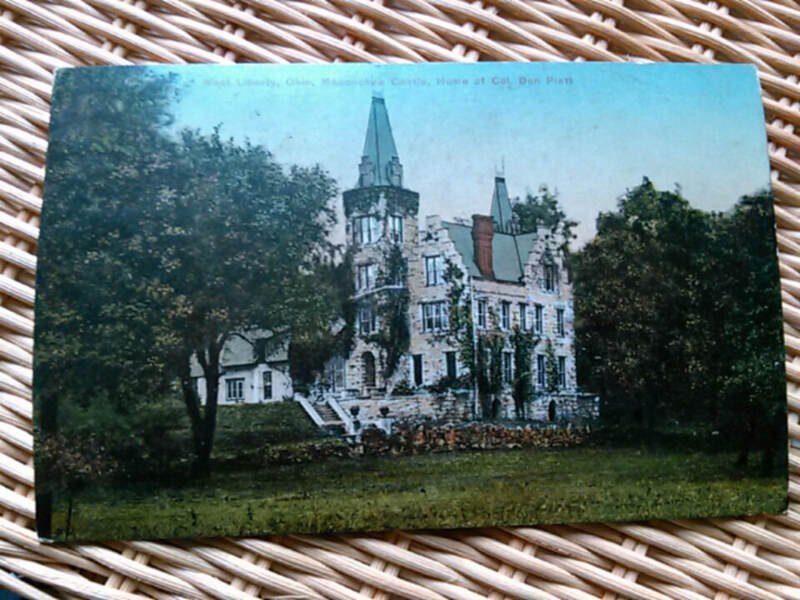 Irene married and Cristine and Isabel moved next to Mac-O-Chee Castle. The ladies set up a home based business, Smuckers Arts, with tapestry, wool, silk, linen spinning and weaving. They were also talented and skilled artists as well. Very knowledgeable on local history and offered historical storytelling inside of Mt Tabor Church they helped get restored as a historical monument. They painted a mural inside of the church as well. The house they lived in was added to over the years starting out as a place for Donn Piatt to write in, a post office for a year, a one story house added on, then a school house built as a second floor. My first tour as a docent at Mac-O-Chee was the ladies next door, the Smucker Sisters, who knew more about the history then I did. Even though I was nervous they said I did a fine job with their tour. They appreciated the positive changes such as plumbing, galvanized cook stove, shower, electrical appliances and furnishings. New ways of farming, the speed of cars and communication. They did comment that they missed the personal contact with the telephone operator when they called someone and they would ask for they number you were trying to reach. Once again a project is in the works to capture local history stories and memories of West Liberty. Berry Digital Solutions LLC with www.mywestliberty.comin conjunction with the West Liberty Historical Society will be taping local residents as they share their stories with generations to come of how West Liberty has changed over the years. The only thing that has not changed is how the residents of West Liberty have always been and will always remain, Tiger Strong. Pictures and sources are from the Logan County Library, Bellefontaine, Ohio. Overlooking beautiful West Liberty, Ohio is Fairview Cemetery. With interesting headstones, some dating back to the 1800's, Fairview Cemetery rests our loved ones' earthly bodies. 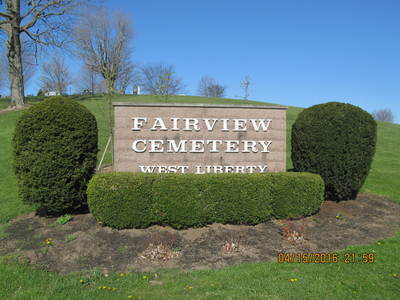 The original name for the cemetery was Grand View Cemetery but circa 1894 the name was changed to Fairview. The 20-acre property was purchased by J. M. Glover on December 15, 1817 for $1,750. It was so named because it elevated 100 feet above town and looks down on the beauty of the Miami Valley. In 1910, Mary A. 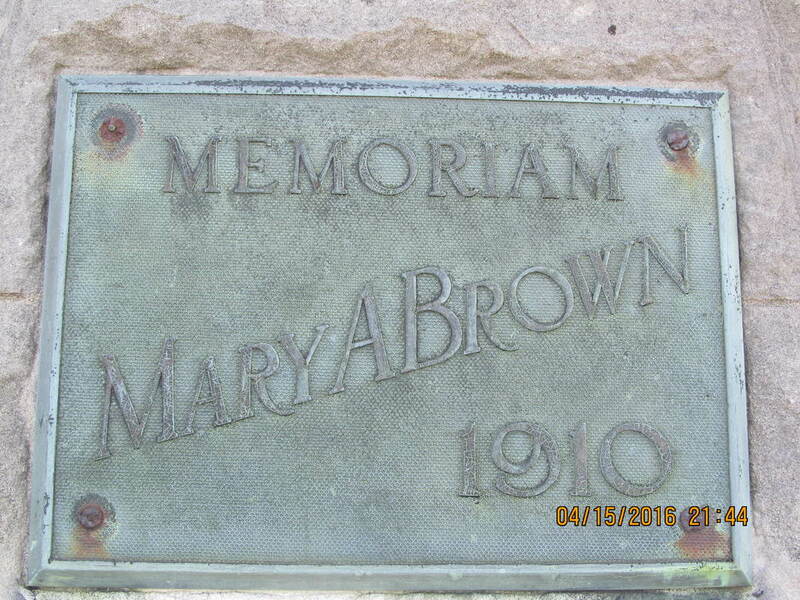 Brown, who lived most of her 94 years in West Liberty, endowed a section of fine farmland to the cemetery. 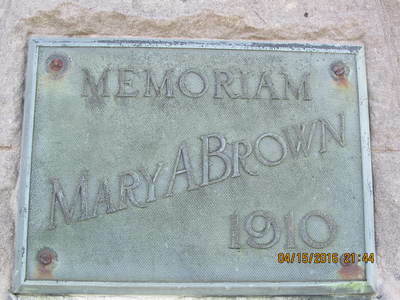 A bronze plaque is set in a sandstone pillar at the entrances to honor her generosity. Her one request was for the preservation of hers and the family burial plot. 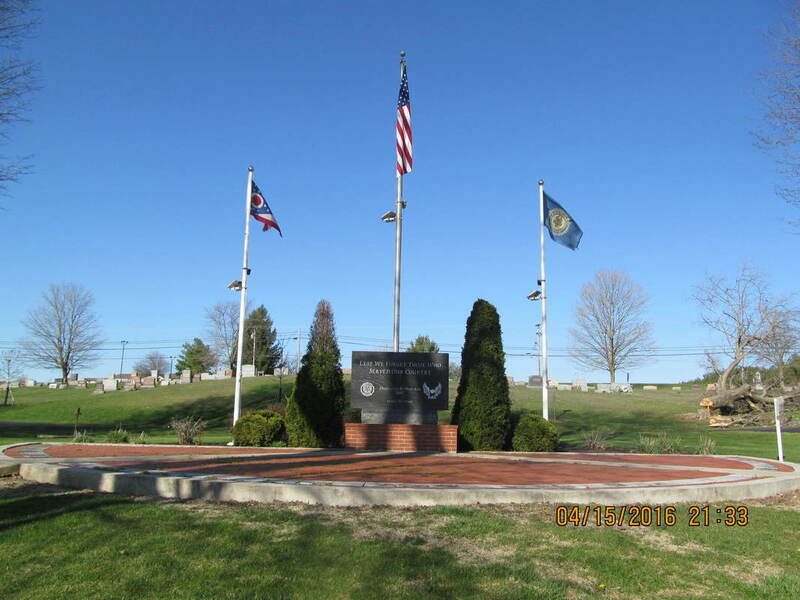 A Veterans Memorial was added in the cemetery and bricks were sold so folks could remember or honor their loved one who served or was serving in the military. These bricks were placed in front of the monument as a loving forever remembrance of their service. Today, this is where they hold the yearly Memorial Day Parade Program. ​Approximately 2000 people attended the #WLSStrong Appreciation Luncheon on Saturday, March 11th in Urbana, at the Champaign County Fairgrounds. 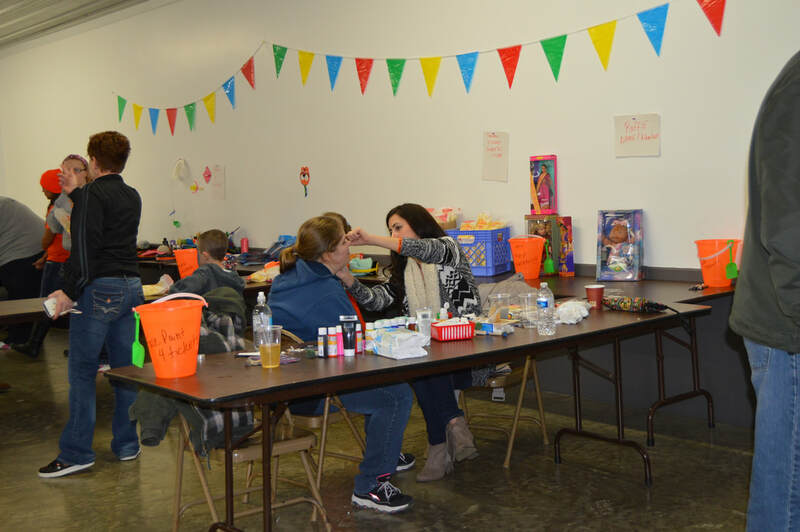 The event was an opportunity for the West Liberty community to show their gratitude and say thank you to the West Liberty Salem staff and first responders for their bravery on January 20th of this year after the shooting at the high school. That Friday was a day filled with waiting. Of not knowing. Wanting to find out what exactly was happening. Were the kids and staff safe? The two ambulances that went to the hospital to take care of the wounded. The families waited to pick up their child or children at the Lions Ball Park. While the West Liberty Community waited and prayed, the West Liberty Salem Staff and first responders went into action working tirelessly to keep our children safe in the midst of such a terrible situation. But from this came good things. Father Tim West with the West Liberty Fire Department and Sheriff Department said, “The best part of living in a small community, everybody chipped in to do what needed to be done.” Each school bus that carried our precious cargo to the ball park were escorted by two police/sheriff cars. Parents anxiously waiting, finally got to hug their child or children and realized their prayers were answered. The support West Liberty community received wasn't just locally it was world wide. People we didn't know were praying. Facebook was flooded with a sea of orange and black and signs were popping up all over West Liberty. Several businesses were giving away free food and drinks. Our hearts were forever changed. If anything West Liberty is a much stronger community. Tiger Strong! The Appreciation Luncheon was a chance to say thanks to West Liberty Salem staff and first responders for taking such good care of all our children. In one building pizza, sandwiches, green beans, slaw, and many delicious desserts were served while enjoying music in the background and talking with friends. 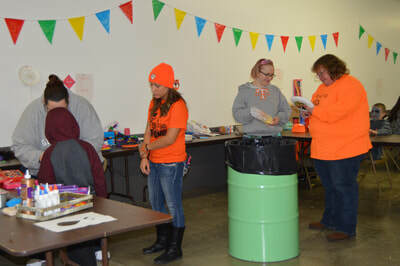 The second building held a plethora of activities. 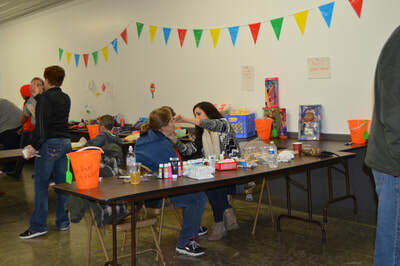 The Kids Zone was well received with games, crafts, face painting and a photo booth. There was a chance to get a massage, buy a t-shirt, gaze at tables full of donated items for the Silent auction, buy a raffle ticket or a chance in the 50/50 drawing. All monies raised goes to the #WLSStrong fund raising committee. 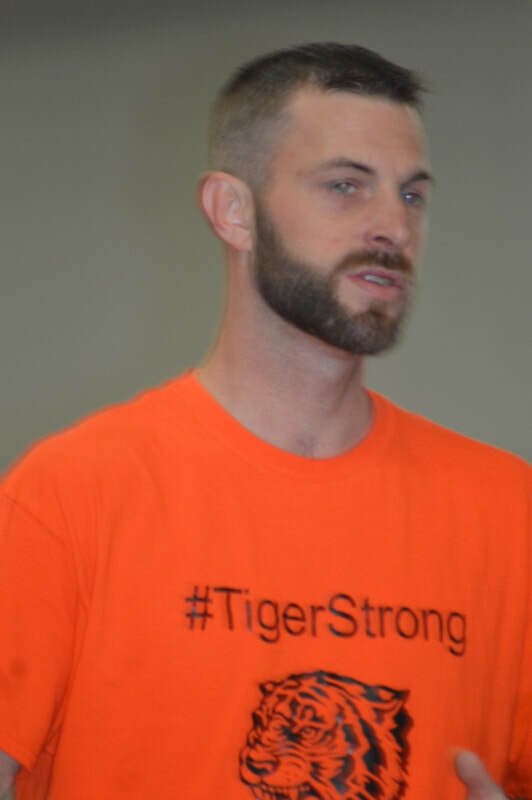 One- Seth Merriman, WLSStrong committee chairperson and father of two WLS Students. Two- Talking with friends and enjoying the food. Three- The basket ball game was popular. Five- Face Painting for all. In order for a new town to grow, businesses must prosper. John Enoch settled in the valley in 1815, opening a gristmill and people traveled miles to get their grinding done. Here are more "firsts" in West Liberty business history. Enoch's sawmill was powered by the Mad River and Mac-O-Chee Creek. A distillery was opened by Thomas Baird on Muddy Run. Hiram White had the first store, tavern and post office on the corner of Baird and Detroit Streets. Dr. John Ordway was the first doctor and lived on Ordway Hill. The first landlord was John Newland, who owned a hotel called "The Buckeye House." West Liberty grew as more people arrived in town and businesses were opened. In 1828, the following businesses were available. Dr. John Ordway and H. M. White were still in town. John Vaughn was a farmer and Baptist Preacher with William Vaughn being a tailor and Baptist Preacher. 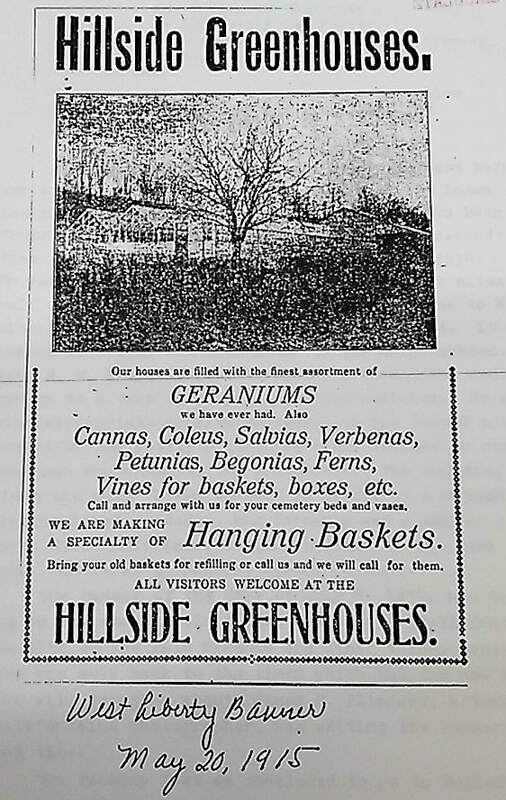 John Williams was the local blacksmith and Methodist Preacher and Benjamin Ginn also a tailor. Robert Crockett and Tillman Longfellow were apprentice with John Vaughn a tanner. The wheel right/ painter was William Moore and William Kenton a tanner.. The carpenter was Thomas Hubbard and Abner Tharp was a wagon maker. The miller was Simon Robinson and Mrs. Polly McCullough and family were mentioned but not the business she had. Businesses at this time were mostly cabins. By 1880, West Liberty had many thriving businesses in the downtown area. In May of that year, a fire wiped out much of the business section on Detroit and West Baird Streets. The town could have died if the business owners had decided to cut their losses and move somewhere else, but they decided to rebuild and save the town. By this time several owners had a large building called a block, with not only their business but rented space to others for theirs. Mention was made of the businesses that were lost, but not those that were saved. Those lost included grocery stores, drug stores, stables, boot and shoe stores, notion stores, the post office, millinery, barbershop, billiard saloon, Odd Fellows Hall, dentistry rooms and a bank. The West Liberty Sesquicentennial Booklet has pictures of the following businesses in town in 1967: Esch's Meats, Liberty Oil & Gas Service, Humble Construction, West Liberty Lumber, Liberty Variety Store, Weymouth Sohio Service, Tastee Freez, The People's Savings and Loan Co., Liberty Machine Products, Inc., Chuck's TV, Craig's Coal Yard Elevator Grain Storage, Robert Brothers, Charles Sharp Realty, George R. (BUD) King Plumbing and Heating, Nationwide Insurance with Herman B. Lockwood, Yoder Electric, Black's Garage, Ross McIlvain Barber Shop and Max's Barber Shop. Also, Ohio Caverns, Piatt Castles, Thoman Bros. Supermarket, Holdren Brothers Inc., T .W. Swisher Realtor, Wilbert's Auction, Atha, Atha and Atha, C & F Apache Camping, Wilkins Funeral Home, Marie's Homemade Candies, Dajolee's Fine Foods, Nuehauser Division of IMCO Poultry, Inc., Farmers Supply, Figley's Drugs, Lenny's Graystone Restaurant, and the Hillside Greenhouse. S&S Tackle Co., Lester E. Wells Plumbing and Heating, King's Market, Nelson Insurance Agency, Saltz Men's & Boys Wear, Thompson's Shell Service, Joe S, Plank Firestone, Hostetter Monuments, Yoder Furniture, Geoff's Laundromat, Liberty Hardware Co., National Soft Water Service, and The Farmer Banking Co. In 2017, a new business opened, one moved to a new building, one is set to open in the Spring, and another business is closing for good. 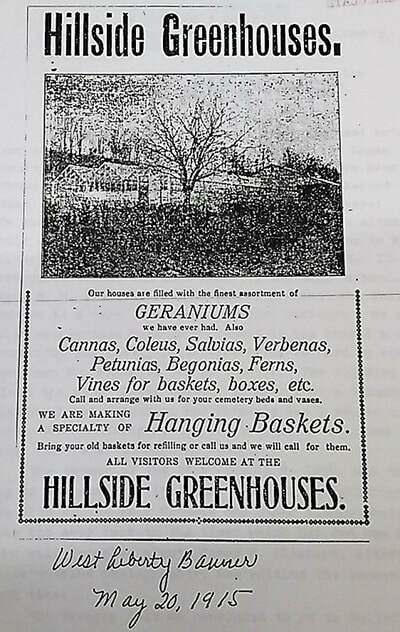 Three of the oldest businesses remaining in their original location include the Ohio Caverns, the Piatt Castles and the Hillside Greenhouse. Visit our Local Business Directory to check out all the businesses West Liberty has to offer! 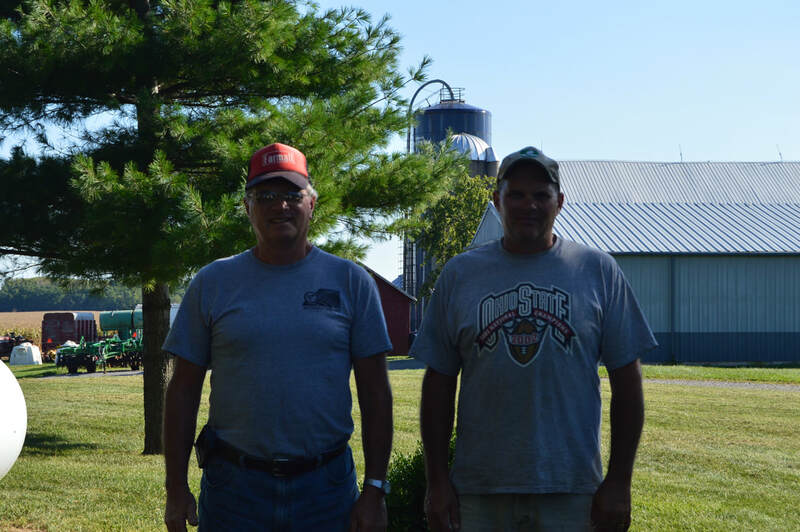 Phillip Neer and son, Steve work together on the farm. 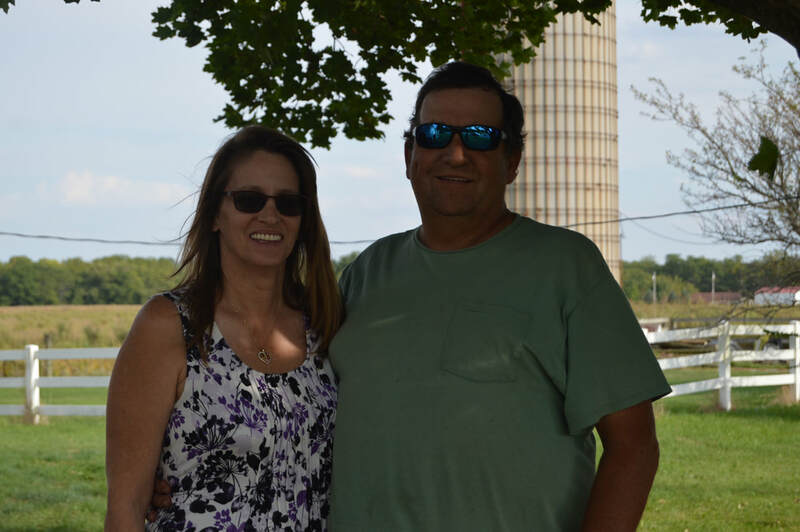 Bob and Cyndi McClure on their family farm. It's Fall Harvest Time! Farmers are busy in the fields bringing in the corn and soy beans. However there are many different kinds of farms such as livestock, trees, farmers markets and many more. Wiki Answers says farming is Ohio's #1 Industry. KentOhio.net reports that agriculture contributes over 98 billion dollars to the states economy. The Kansas Department of Agriculture states this. Farmers- they are more than you think. Mechanic, meteorologist, scientist, machine operator, agronomist, computer operator, and animal caretaker. Ask a farmer and they could probably add a few more. There are many things to be learned on a farm and ways to learn. You learn by watching others, listening to others as they talk, seek advice from seasoned farmers and your own trial and error. Besides crops, farm families have raised horses, dairy and beef cows, sheep, goats, llamas, alpacas, donkeys, and poultry, to name a few. My girls, Lindsey and Lynda, raised rabbits for their 4-H projects. On a farm you usually have a dog and maybe a cat or two. The farmers raise their children on the farm and they all have chores they are responsible for . It's not just a way of life it's a wonderful heritage they give to their children and then their children pass to their children for generations. Phillip Neer's father, Alvie Lapp started farming with a threshing machine. His father Dwight continued on the farm with his father. 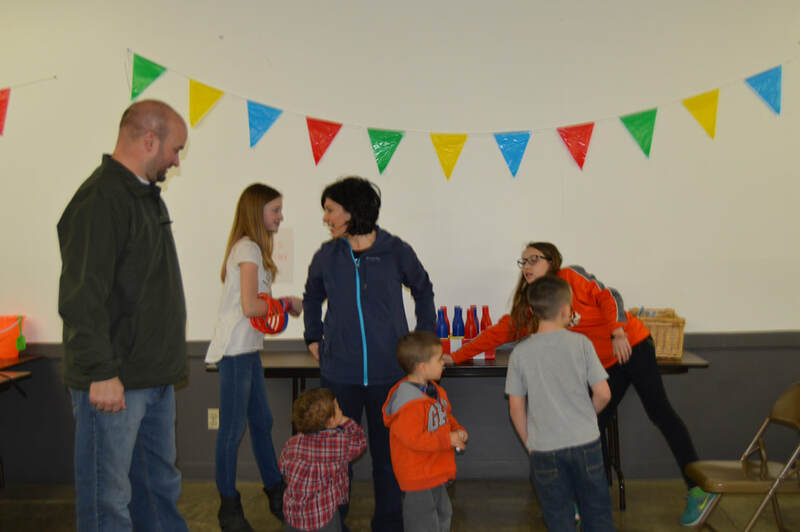 Phillip's son, Steve with wife Surnea and their four children, help on the family farm making the fourth and fifth generations. Neer and wife Reva, have 65 Dairy Cows and feed out Bull Calves to sell. They have about 800 acres of corn, wheat, soybeans, and alfalfa. They had a milking parlor in the 1970's. Bob McClure and wife Cyndi, live in the farm house he was raised in by his parents, Dale and Pat McClure. Bob's son, Bobby McClure, fifth generation, also helps on the family farm. They milk 73 cows and have 1,100 acres of corn and soybean crops. McClure remembers as a child, there was a tornado headed their way, so he and his parents headed to the basement. Once he got to the basement he realized his parents were still upstairs looking out the windows reporting to each other, the damage the tornado was causing. Never a dull moment on the farm. Farming communities are close and when help is needed they pitch in and do what is what they can. Putting in the crops, helping with harvest or with milking. They are there, neighbor helping neighbor. Hardworking people who continue with life on the farm, sharing the special farming heritage passed down to them. Happy and safe Harvest! The Lions Club members have served the West Liberty community since 1941. They are busy year round helping others in many ways. They collect old eye glasses and help with eye research. Emergency help like fire or accident victims, help with non-profit fundraisers, providing gas cards if someone needs help getting to and from the hospital, to name a few. 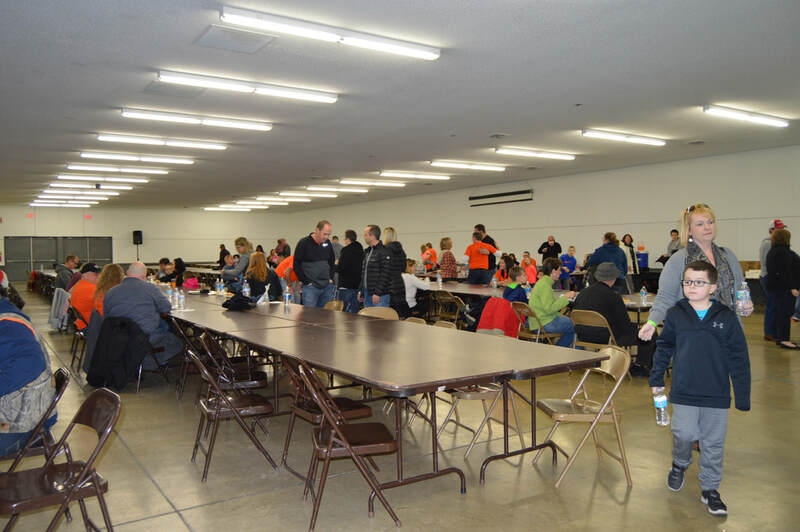 They hold several fundraisers such as the Pancake Breakfast, summer Fish Fry's, and the Ham and Turkey raffle. They sponsor a Circus, float in the Christmas Parade and the 5th grade Dictionary Project. The ball park is always packed to watch the awesome fireworks display put on by the donations of West Liberty villagers. Their biggest venture is the 40 acre ball park that they maintain for all sorts of fun events. Family or other reunions, sports practices and games, midget quarter races, non-profit events, walk path and playgrounds for the children. The Labor Day Festival is their biggest community 3-day event filled with all sorts of fun things to do, to see and delicious food to eat. This year they held their 51st festival and the parade was the big kickoff. If you had any doubt that West Liberty and surrounding area of being a farm community you wouldn't after seeing the “Tractor Parade.” Our farm families, several generations strong, proudly show off their tractors of all ages and colors and line the parade route interspersed with community floats, sports teams and our great WL-S High School Band. We are proud of our fire and police departments who led the way. Antique Equipment Show, gas engines, sawmill and tractors are displayed on the grounds. The children's tractor pull, bingo, antique tractor pull, duck races, softball games, lawn mower/go cart races and a favorite, Willie Yoder's tug of war over the Mad River. Church service, great entertainment, Chicken BBQ and other delicious food, flea market and craft vendors. Something for everyone and a good time was had by all! ​If you are interested in being a West Liberty Lions Club member call 937-465-4081 and leave a message.